At its Open House event from April 21-22 in Heilbronn, Germany, Illig debuted its large automatic pressure forming machine of the RDM-K series to more than 200 guests under the motto “World of Cups 2015”. Cups with sealed rims were produced on the new, large IC-RDM 76K out of polypropylene (PP) using a 60-up mold, cup diameter 75mm, height 100mm, with an hourly output of about 126,000 cups. It has a bigger forming area of 760x530mm compared to its IC-RDM 75K machine (700x450mm). The weight of the lower table is reduced to allow high movement speeds in spite of the enlarged forming area. Further performance features include calculation of basic setting for all heater and machine parameters, process monitoring to detect possible material tears, visualization of process data for analysis and optimization of the thermoforming process, optimized mold change, etc. 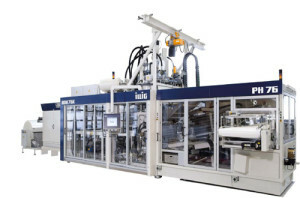 In addition, Illig presented six other thermoforming lines demonstrating serial production of samples of different shapes and sizes. One of the highlights was an IC-RDM 70K, interlinked with a newly developed RDML 70b IML-T unit. Decorated rectangular PP tubs were manufactured on the IC-RDM 70K production line with RDML 70b, forming area 680x300mm, using an 18-up mold, at a speed of 16 cycles/min resulting in an hourly output of 17,280 tubs. The tubs were decorated on all four side walls and the bottom during forming with an In-mold Labeling (IML) unit especially designed for this task. It removes the printed labels from a magazine and places them into the mold’s cavities in the forming station of the thermoformer. During the subsequent forming process, the label bonds permanently and true to contour with the part’s walls. The large decoration area is a special benefit contributed by the IML-T technology which, among other purposes, can also be utilized to comply with the new legal obligation to provide nutritional information, explained Illig. Moreover, the label can even add to increased pack rigidity, subject to geometry and quality. As a result, the material thickness can be reduced and the pack’s top load is still maintained. Every cavity in a mold can be loaded with an individually printed label, an advantage provided by Illig’s IM-T technology to allow for fast product changes. Labels made of all conventional materials can be processed as well as labels made of polystyrene (PS) and PP even through to paper labels.